Photo: Martin LuedersSarajevo 1997. This cemetery was once a field where people played. 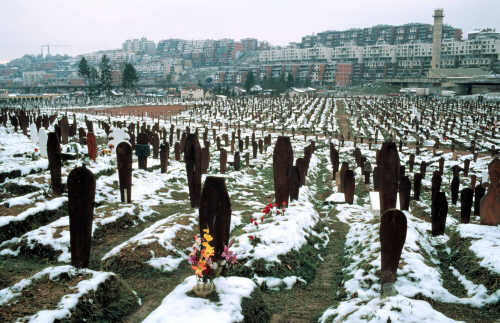 At the start of war in the former Yugoslavia in 1992, the Serbian government attacked Sarajevo, the Bosnian Capital. The 43-month siege and artillery bombardment killed civilians, separated families and made daily life a matter of survival. Science and Policy and a Visiting Scholar in Anthropology at the Massachusetts Institute of Technology. Research Institute and the former editor of Bread for the World’s World Hunger Report. Bread for the World Institute. “After 20 years of optimism, international food and nutrition experts are presenting a more cautious world food outlook (see, for example, Pinstrup-Andersen, Pandya-Lorch, and Rosegrant, 1997). Although the world as a whole now enjoys a food surplus, over the next two decades annual growth rates of major cereal crop yields are expected to slow, while global population is expected to grow by 2 billion people. Cultivated land areas are diminishing, and environmental and biological resources are also being degraded and destroyed. Developing countries also face economic threats to their food security because multilateral trade agreements will likely reduce food surpluses in the developed countries, raise grain prices, and shrink food aid. Future food security in developing countries is also menaced by cutbacks in foreign assistance, an increasing proportion of which is now allocated to disaster situations, reducing the amount available for agricultural research investment. These factors suggest that developing countries will face growing food deficits and food and nutritional insecurity. They may also face environmental degradation and natural resource scarcities that will end in greater competition and conflict (Brown and Kane, 1994; Kaplan, 1994). Several recent studies have proposed a significant link between environmental resource scarcity and violence (Homer-Dixon, 1991, 1994). This paper expands this proposition to consider significant linkages among environmental resource scarcities, conflict, food, and hunger. The paper argues that armed conflicts (those involving more than 1,000 deaths) or “food wars” constitute a significant cause of deteriorating food scenarios in developing countries. Food wars are defined as wars involving the use of hunger as a weapon or hunger vulnerability that accompanies or follows from destructive conflict (Messer, 1990). They have already been shown to be a salient factor in the famines of the 1980s and 1990s (see Bohle, 1993; Messer, 1994; Macrae and Zwi, 1993, 1994; Messer, 1996a). Although geographic information and famine early warning systems and international food reserves established after the famines of the mid-1970s provide both timely early warning and a capacity for emergency response, the social disorganization that accompanies conflict prevents food distribution. Food wars are also a growing cause of chronic underproduction and food insecurity, where prolonged conflicts prevent farming and marketing and where land, waterworks, markets, infrastructure, and human communities have been destroyed. The data suggest that most countries and regions that are food insecure are not hopeless under producers but are experiencing the aftermath of conflicts, political instability, and poor governance. Their food production capacities are higher than current projections predict. Reciprocally, food security can help prevent conflict and is essential for sustained and peaceful recovery after wars have ended. A principal source of conflict lies in lack of food security, as experienced by different households and communities; religious, ethnic, and political groups; and states. Yet both peace and food security remain elusive for many war-ravaged countries where decimation or flight of material and human resources make a return to normal food and livelihood security difficult to achieve. To many analysts, this pernicious cycle of hunger, followed by conflict, followed by hunger, seems unbreakable. Neo-Malthusians, concerned about population growth and economic stagnation, especially in Africa, insist population-resource imbalances lead inevitably to hunger, accompanied by illness, warfare, and excess deaths. They view the developing world as either a powder keg of civil disorder and violence or a basket case of environmental deterioration and destitution (see Kaplan, 1988, 1994). But case studies so far have been unable to identify the exact thresholds of environmental deterioration or perceived scarcities that push populations over the line into decay or violence (see Homer-Dixon, 1991). Anti-Malthusians counter that population pressure-led cycles of scarcity, crisis, and destruction can be averted and that scarcity is always relative to human ingenuity, technological innovation, social restructuring, and political and economic policy (Boserup, 1965). Technological optimists argue that population, far from being an inevitable time bomb, actually triggers technological and infrastructural improvements. This perspective appears in the early literature of the Green Revolution (Sen, 1975), in the writings of certain African technologists (Juma, 1989), and in the encouraging food outlooks of certain economists (Mitchell and Ingco, 1993) and other analysts such as Simon (in Myers and Simon, 1994). These optimists argue that evidence for deteriorating resources is faulty and that technological innovation and application can meet the challenges. Unfortunately, none has been able to demonstrate how in contemporary war-ravaged settings, human populations might serve as a resource and stimulus to restore hope, rebuild food security, and remove despair. To read the full article, see Messer, Ellen, Mark Cohen, and Thomas Marchione, “Conflict: A Cause and Effect of Hunger,” in Environmental Change & Security Project Report, No. 7, The Woodrow Wilson Center.